Molluscum contagiosum is a skin disease caused by a virus that causes clusters of tiny, firm, flesh-colored or pearly bumps. The infection is mainly spread by direct skin-to-skin contact. The bumps or lesions appear at the site of contact anywhere on the body except the palms of the hands and soles of the feet. 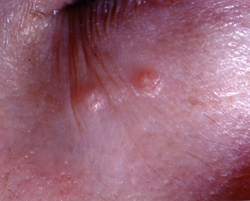 Anyone can get molluscum contagiosum, but the vast majority of those who get it are children. Most people who get this condition are otherwise healthy. However, people with HIV or other immune-suppressing diseases can more easily become infected.